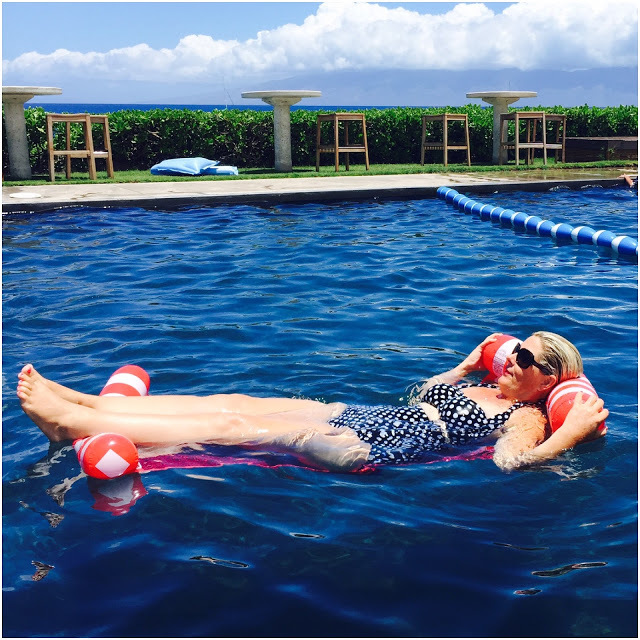 Unless you have been under a rock, then you know I just spent 16 thrilling nights in Maui and Waikiki with the ocean breeze in my hair, a cocktail in hand and a great change in pace. We went to celebrate my husbands momentous 40th birthday and had the most amazing time. I fell in love with Hawaii when I first visited Kauai 2 years ago. 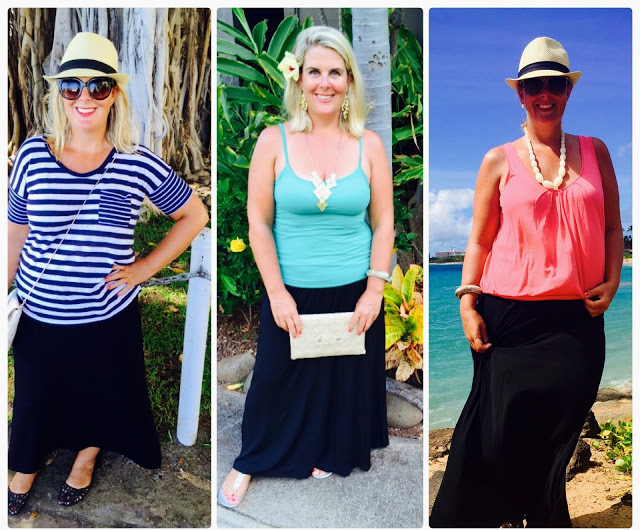 As promised, I am showing you some of my most versatile vacation outfits. 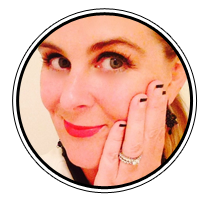 So, on with the show……….. This season, I really embellished in the high wasted bikini. 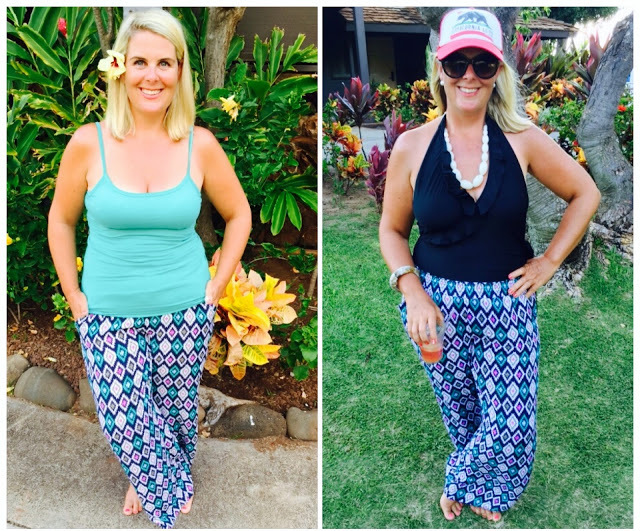 A few things attracted me; the chance to try a fun trend, the opportunity to be once again in a bikini post kids, and I loved how it was a great fit for a delicious pear shape such as myself. I chose two fun prints. A fun black and white polka dot and a floral pink number. 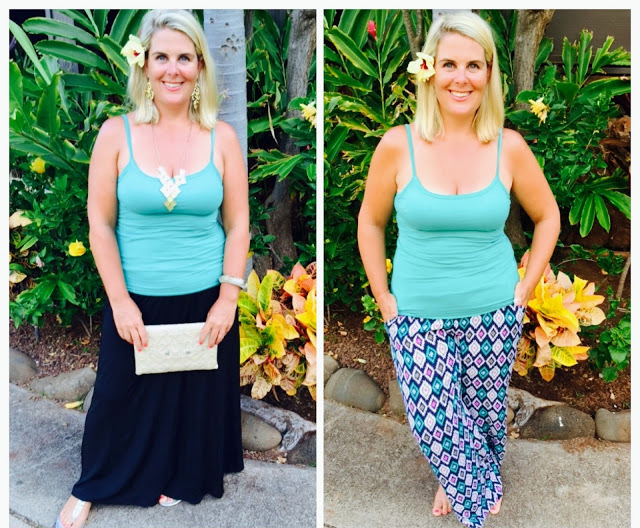 Both from Swimsuits for All , and under $40 each. I’m interested to see what they come up with next summer. They took a beating of chlorine, sunscreen, being rinsed in hotel shampoo and sea water AND they still look great. No fading or change in shape. A black skirt and a black dress that are crush resistant and easy wash-and-wear are my absolute #1 must-haves in a suitcase. 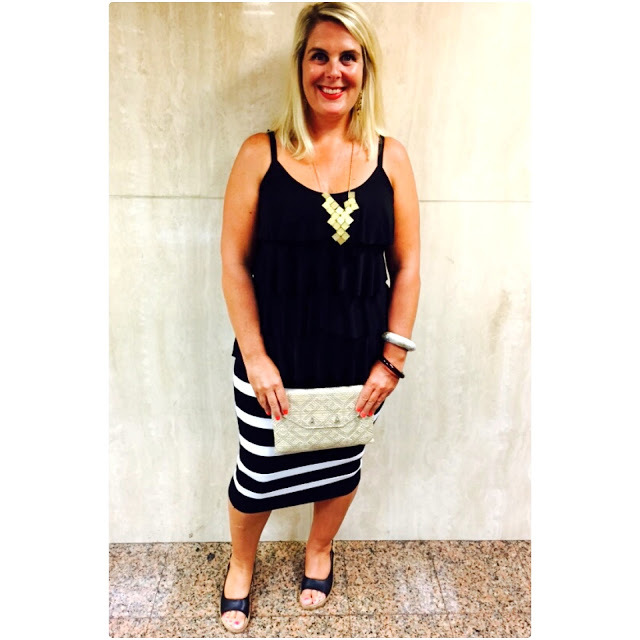 On a few occasions, I pulled the black dress to my waist to turn it into a fun skirt. It took me from airplane travel where one needs to be uber comfortable to waterfall and roadside fruit stand sightseeing. My most recent purchase from Anthropolgie. 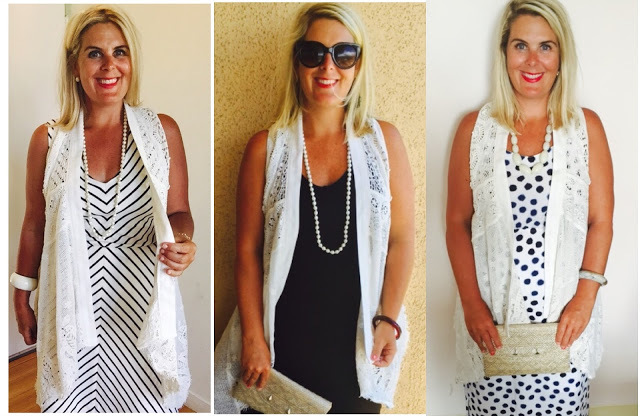 You will see in the three photos that it was a great extension to a basic summer dress. I took two hats, my fedora as well as a fun trucker hat from Billabong. 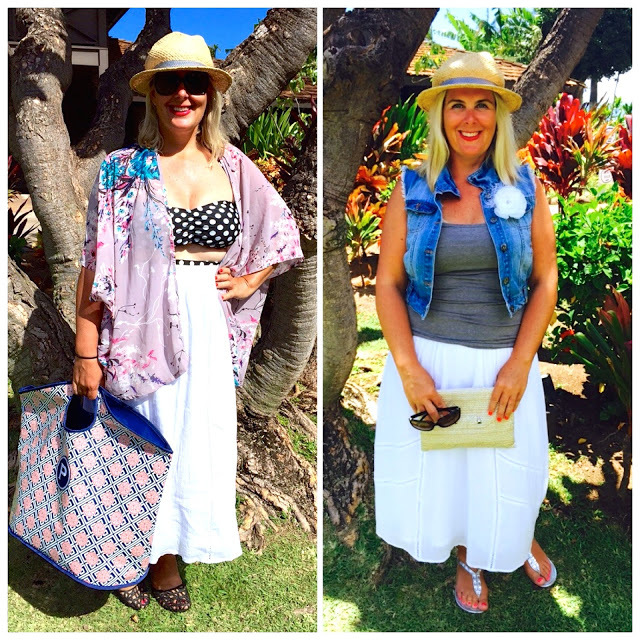 The fedora hat I took on the way over didn’t make the flight in one piece (I stuffed it with clothes and it lost shape – see white skirt pic below) so I tossed that, and started fresh with a very sturdy Panama Jack (see black skirt pic above) I purchased in Maui form $35 and wore it on the plane home. Live and learn, no more stuffing fedoras into suitcases for me! My white skirt was a another favorite and the white color wore VERY well. No stains! You’ll see in the photo that one day it took me from morning poolside to lunch out at a local cafe to celebrate my nephews 14th birthday. I will say though that since purchase, the elastic has warped a bit with sea water and its a bit loose, nothing a session in the dryer won’t fix. 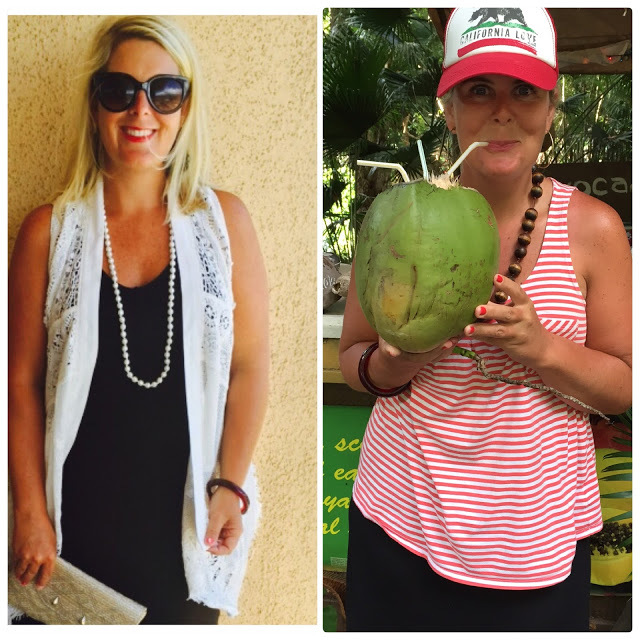 Another pleaser was my rattan clutch from Stella and Dot (shown in MANY of the photos). I was in love with this piece the moment we met. It looks gold at some points but it’s actually only rattan with silver thread. It can be thrown under arm or add on a strap to use cross body. I took this from sightseeing to partying (on my only night out). My Mox went every where with me. I brought my black pair. One day we were snorkeling in a very rocky and mossy area and I was so grateful to have them on my feet. I hear they are bringing out a gold pair soon, happy days! My PJ top took me from a comfortably stylish lunch outfit to right to bed! As well as the pajama pants taking me from right in bed to an outfit fit for relaxing cocktails by the pool at happy hour. My husband would never let me hear the end of it if we didn’t get out one night and hit the dance floor. We certainly did and had so much fun! I had packed one very comfortable party outfit. I used literally EVERY item in my suitcase and only hit the laundromat one time. I have ALOT of washing coming my way and half the sand from Waikiki is in my suitcase LOL. is the only time we get to. (I’m a bit of a stickler on bedtime rules in my house). I loved hearing them breath (all three in unison) and smelling them before I went to sleep. That’s right, breathing them in and remembering them in that sleeping moment at 9, 7 & 3 years of age. YummoMummo is back up and running now, so expect my usual posts twice a week. I have some posts I really want to share with you, going a bit more skin deep so I hope you look forward to that.